Our Interpersonal Spaces' are usually reserved only for those with whom we are considerably affectionate towards (friendship or otherwise). In each of the images shown here, personal space has been significantly invaded. 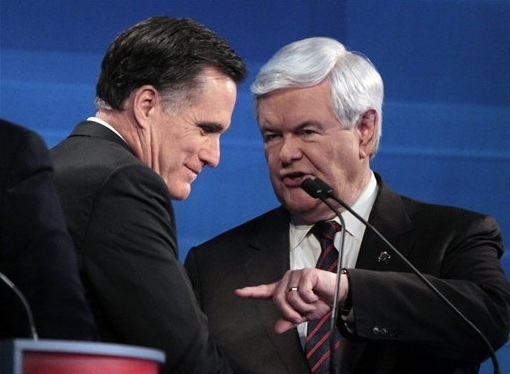 Above, Mitt Romney is even touching Newt Gingrich's chest (during a break at the Republican Presidential Debate in Jacksonville, Florida). Below, the former Speaker of the House is invading the former Massachusetts Governor personal space with a classic index finger point - a major faux pas in virtually all situations. In the vast majority of circumstances, these encroachments would be alienating and be interpreted as hostile and in some settings even precipitate violent reciprocation. 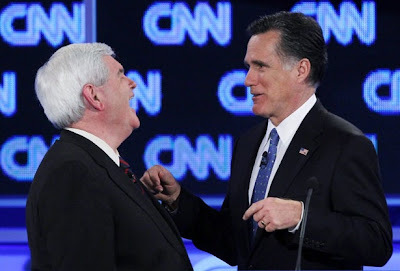 When on stage during a break in the U.S. Presidential Debates though, there is a false sense of friendship-intimacy. If these same men were to use these identical nonverbals discussing the same issues, on the same day - only in private (or for that matter, even a few minutes later when the debate is ongoing), it would most assuredly provoke hostility and anger. Regardless of their country or their party, most politicians, behave as if they have the right to invade our interpersonal spaces. As if these otherwise normal social behaviors, somehow don't apply to them. In any other setting we may call this narcissism. The most important goal of any politician is to develop rapport - as it certainly should be - and therein gain votes and support. Mitt, Newt and all leaders would do well to stop ignoring these important body language rules.